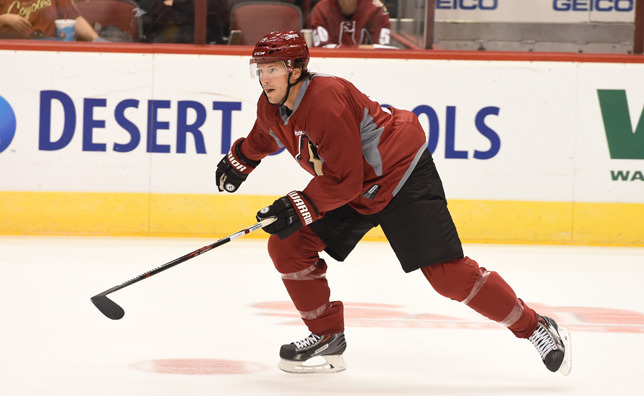 GLENDALE – The Coyotes trimmed their training camp roster to 31 players on Sunday. Among the 11 players dropped included 2014 first-round draft pick Brendan Perlini who was assigned to the Niagara IceDogs, his junior team in the Ontario Hockey League. "Rookie camp was very good for him (but he) just wasn't able to translate to an NHL level yet," Head Coach Dave Tippett said. "He's a young player that still has lots of work to do and that's going to happen. There's a process you have to go through and he made huge strides this year. He'll go back and continue to push his game forward in junior." The Coyotes like Perlini's speed and skill but the consensus is he needs to work on the details of the game and improve his strength. Brendan Perlini. Photo by Norm Hall. Forward Christian Dvorak also was assigned to his junior team (London, OHL) on Sunday. “Brendan Perlini and Christian Dvorak had very strong camps but, similar to Max Domi a year ago, we felt they will benefit from another year of junior hockey,” General Manager Don Maloney said. “With Max, Anthony Duclair, Dylan Strome, Henrik Samuelsson, newcomer Matthias Plachta and the strong play of Jordan Martinook all competing for the opening day roster, plus the need to get out established NHL players ready for the regular season, Dave Tippett and I feel this is the prudent, long-term decision." Seven players were assigned to the American Hockey League. They are: Craig Cunningham, Tyler Gaudet, Marek Langhamer, Lucas Lessio, Dakota Mermis, Brendan Shinnimin and Niklas Treutle. Two players – Keith Aulie and Patrick Dwyer – were released from their professional tryout (PTO). Nine more players must be trimmed from the roster before the season starts on Oct. 9. ► The Coyotes left for Canada after Sunday's practice for back-to-back preseason games vs. Vancouver and Edmonton on Monday and Tuesday, respectively. "It's very important for our team," Tippett said of the trip. "...We met this morning and we talked about the next phase of training camp where it's less about player evaluation and more about finding the rhythm of your team and lines and the structure of your game and special teams. All those things have got to really be put into place this week." ► Captain Shane Doan, who has yet to play a preseason game because of a lower-body injury, accompanied the team on the trip to Canada. Shane Doan. Photo by Norm Hall. "Shane looks like he's ready to play tomorrow," Tippett said. On Sunday, Doan was skating on a line with 2015 first-round pick Dylan Strome, who was born less than a year after Doan and the Winnipeg Jets moved to Arizona in 1996. The two have been chatting more and more as camp has evolved. "Obviously he knows what it takes to play in the League for a long time and we're kind of in the same situation - he played as an 18-year-old in the League," Strome said. "I think he knows what it takes. Obviously he's been doing something right for all these years to keep playing and continually play and play a lot of games every year, so I think it's important that when a guy like that offers advice you've just got to take it and run with it. Everything he says is so valuable." ► Tippett said he's hoping goalie Mike Smith, who was scratched from Friday's preseason game at San Jose because of soreness, will play one of the two games in Canada. Meanwhile, forwards Brad Richardson and Anthony Duclair did not skate on Sunday because of minor injuries suffered on Friday. Tippett said neither player would play on Monday but possibly on Tuesday. ► Monday’s preseason game at Vancouver will be broadcast on NHL Network. The puck drops at 7 p.m. (Arizona time).